From about the mid 1930s to the present, any leading man that wore a tux on screen was duplicating the persona that Cary Grant created. 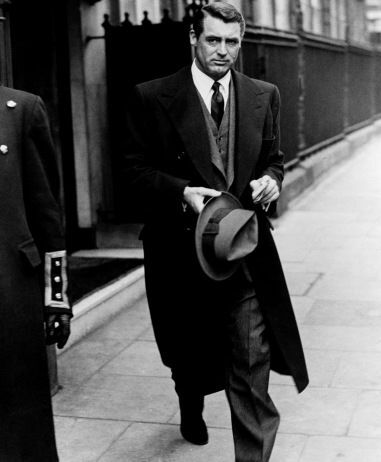 Dashing good looks and charm made Cary Grant a mega movie star and a film legend. For 33 years he was America’s ultimate movie icon. The ultra smooth British born actor created an image that every man envied and admired. Cary Grant (whose birth name was Archibald Leach) himself even joked about the larger than life persona that he created by saying “Everyone wants to be Cary Grant, even Cary Grant”. What you can learn from him: Don’t take yourself too seriously. Although the way Grant looked was what attracted people to him, his willingness to take on self-deprecating comedic roles added to his confident image. He never took his looks too seriously on screen and in real life and often joked about the how others made a fuss about ‘Cary Grant’. No matter how attractive or unattractive you are, the way you look should not overshadow who you are. Be able to laugh at yourself and you will display a unique brand of confidence. The Oklahoma born, son of a trucking firm manager, never wanted much growing up but soon found acting to be his calling. Brad Pitt was in college as a journalism major when he decided to take the $325 in his pocket and move to California to become an actor. Brad Pitt combines a cover boy look with polished acting ability to create the image of the modern movie star. On screen his acting looks effortless and smooth as he floats his way through scenes. The pulling-power that Pitt has enables him to alternate from heroic blockbuster roles to deeper, more interesting roles. Although Pitt does not enjoy his pretty-boy stud image, he does use it to his advantage. Sometimes people have a skill or an asset that they do not want to tap into for whatever reason. However, that asset might be the key to open the door of what they really want to do. Not since Sidney Pottier has there been a black leading man that captured universal appeal the way Washington does. The roles that he plays are usually supremely confident and unshakably powerful. Never afraid to play strong and sometimes threatening black characters, Denzel has confidently asserted himself to be a favored actor among all races. As a serious child who was brought up with an intense work ethic, Denzel found acting to be a release from his sometimes uptight personality. Willing to take on challenging and risky roles, Washington said, “It was instilled in me as a young performer to take chances because failure is a part of growth. If you’re gonna fail, fail big and take chances”. The people who fear risk are the people who don’t succeed. Denzel took many chances in his career some paid off, others did not. But no matter what, he keeps on taking risk. In your life when you take calculated risk you reap from your successes and learn from your failures. Experience is the best teacher but you will never experience unless you are willing to risk. Who would have thought that a man who was abandoned by his parents at a young age would one day be the most popular movie star in the world? The ninth grade dropout and ex-street gang member spent most of his teenage years taking odd jobs, hitchhiking and hustling his way across America. After an honorable discharge from the Marine Core, Steve McQueen found himself at The Playhouse School of Actors in New York because “that’s where the girls were”. 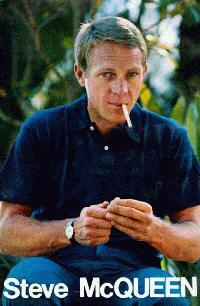 Sometimes called the King of Cool, McQueen was essentially the same character in most of his movies. And those roles were essentially who Steve McQueen was. The tough as nails, rebel who exuded masculinity showed little fear in real life and on the screen. It was this mystique that had women wanting him and men wanting to be him. One thing that attracted people to McQueen was his genuineness. He was who he was no matter what. Even though he was a movie star he could often be found hanging out with the stunt men, drinking a few beers. While visiting The Boy’s Republic (a juvenile detention facility where McQueen once did some time to as a teen) the now famous movie star sat at a table to eat some ice cream with some young inmates. The boys were surprised and amazed that Steve ate his ice cream with a fork not a spoon just like they did. Even though it was years since he was locked up, McQueen remembered who he was and stayed who he was. Whatever you do in life and wherever you go, people will try to change you and tell you who you are. Once you know who you are, be who you are. Realness is a quality that is becoming extinct. Be real and be you. One of the most respected actors in Hollywood, Deniro has established himself as one of the biggest icons in movie history. Robert Deniro grew up as a quiet child in the little Italian neighborhood in New York City. After playing the cowardly lion in a school production of The Wizard of OZ, Robert got over his shyness and later pursued a career in acting. The actor is most famous for his roles as Jimmy the Gent in Goodfellas and a young Vito Corleone in The Godfather II. But he also shows his ability to dedicate himself to his work in movies such as Raging Bull when he puts on a performance that should be in a museum. Deniro’s dedication to his method acting style has paid off in a career that has lasted over 30 years. In preparation for his role as boxer Jake Lamotta in the masterpiece Raging Bull, Deniro followed the real Jake Lamotta for weeks, trained extensively and entered three genuine Brooklyn boxing matches (winning two of them), and even gained a record breaking 60 pounds in order to play Lamotta in his later years. Dedication to whatever you do is important and can bring great confidence. Sometimes called the new Cary Grant, Clooney has risen to be the new standard for male actors. The son of broadcast journalist Nick Clooney, George seemed to have show business coursing through his veins. After his dreams of being a professional baseball player with the Cincinnati Reds vanished, George began auditioning and landing television commercials. The charismatic actor who gained fame on the television drama ER is now considered to be the Renaissance man of Hollywood. Well liked by writers, directors, and fellow actors Clooney has solidified his place in movie history. The ability to get along with others is an extremely valuable quality to possess. Being the good guy can certainly be an advantage. Clooney’s likability on and off screen has been a great key to his success. Your ability to project the same image may also help you succeed. 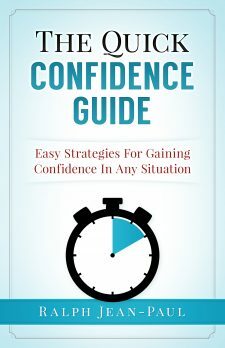 Being confident is not about being cocky. Some people are afraid of being nice because they fear other people will take advantage of them. Be confident in yourself and treat others the way you want to be treated and if they don’t like it or try to take advantage, move on. As the Fresh Prince, Will Smith gained fame and notoriety by delivering comedic raps in the late 80’s. He soon followed that with a hit television show called The Fresh Prince of Bell-Air. You would think that as a movie actor Will Smith would’ve found success in comedic roles. However, it has been action films like Independence Day and Bad Boys that has made him one of the top action heroes of the past 15 years. He has also showed his ability to execute dramatic acting in the movie The Pursuit of Happyness where he was nominated for an Academy Award. The true display of how far he has come from his Fresh Prince days was his performance as Mohammad Ali in the movie Ali. From rapper, to comedian, to blockbuster action hero, to dramatic actor, Will Smith will probably always have a job in show business because of his versatility. 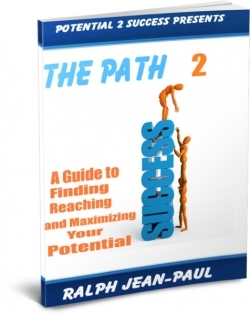 On the road to success being able to switch roles quickly and effectively can make the journey easier. You never know what opportunities will come your way so be ready to adjust, adapt, and change. After a failing music career, Johnny Depp was urged by his then wife to pursue an acting career. After an introduction to Nicholas Cage, Depp landed small roles in Nightmare on Elm Street and Platoon before reluctantly accepting a role in the Fox police drama 21 Jump Street. Depp was not pleased with the pretty boy teen idol reputation that the television show soon brought and would soon find different roles that would erase that image. Johnny Depp is known most for his choice of odd, unusual, and sometimes weird characters. His ability to play unique roles such as lovable freak Edward Scissorhands and the eccentric pirate Captain Jack Sparrow in the Pirates of the Caribbean is not common among most mainstream actors. It is the decision to take on different and more challenging roles that has made Depp a popular and well respected actor. Cookie cutter images are a dime a dozen but when you try something different others will notice. Trying new things to anything you do can give your life a fresh perceptive and may also expand your thinking. You have to be a real confident person in order to take on some of the acting roles that Depp has. If you are truly confident in yourself you will be able to showcase your uniqueness without wondering what others will say while at the same time, not caring what they say. This was a short list but here are some honorable mentions: Tom Cruise, Jimmy Stewart, John Wayne, Sidey Poitier, Russel Crowe, James Cagney, Jack Nicholson, Jamie Foxx, Harrison Ford, Sean Connery, Al Picino, James Dean, Marlon Brando, Clint Eastwood, Clarke Gable. I have never seen movies by Cary Grant or Steve McQueen. Would you please recommend some movies to see them in action? Steve McQueen as a confident cowboy in “The Magnificent Seven”, a bold inmate in “The Great Escape” and a millionaire bank robber in “The Thomas Crown affair. Cary Grant was great in the Hitchcock movie “North by Northwest” and also played a business man who tried to seduce a younger woman in “That Touch of Mink”. Hope you enjoy!